Holding Camon CX in your hand, the smooth styling of it offers not only outstandingly comfortable grip, but a look so stunning that you won't be able to take your eyes off. The CX is an upgrade of the Camon C9 and the latest smartphone from TECNO Mobile’s range of camera-centric smartphones. The naming of the smartphone is awesome. Most had expected the smartphone to be named the Camon 10 but the choice of its roman number equivalent for 10, i.e X, was a fantastic branding move since it gives the smartphone a fresh appeal. You get a 16 MP camera as the rear camera and an identical 16 MP camera as the front-facing camera. The front-facing camera promises high-quality selfies though a number of additional features included in the camera. For starters the selfie camera has a zero lag shutter and thus excellent for shooting people/object in motion. In addition to this, the selfie camera uses 4-in-one tech to capture four images and use software to select the optimal photo. The Tecno Camon CX comes with a 5.5-inch IPS LCD display with a 1920 x 1080 Pixels resolution. The profile is identical to that to the Camon C9. The Camon CX comes with a 2.5D display, up from the 2D display found on the Camon C9. The TECNO Camon CX has a fantastic design. The smartphone has an all-metal construction and the focus of the design being on the 7.75 svelte profile (the CX is 5.66mm thin at its thinnest part). A 1.5GHz Octa-Core MT6750T chipset powers the Camon CX. This is coupled with 2 GB RAM for seamless operation. 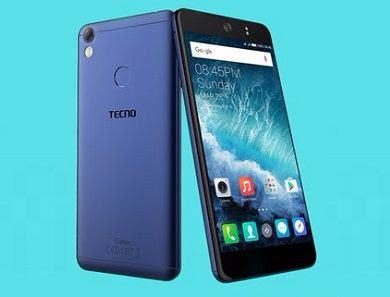 The Tecno CX comes with 16 GB of internal storage, which is disappointing considering that 32 GB internal storage is the standard for most smartphones. I had expected the smartphone to come with at least that capacity. It is however great that the Camon CX comes with a micro-SD slot that can handle up to 128 GB of memory. A Li-Polymer 3200mAh battery powers the Camon CX. The capacity is a 200mAh more than what was offered with the Camon C9. Order the TECNO Camon CX​ today and have it delivered to your doorstep within 1-3 working days or same day delivery within Nairobi. Payment on delivery.